Former US Special Forces soldiers on freelance anti-terrorist missions, front companies and an alleged private jail. The story of the three Americans arrested by the Afghan authorities in a Kabul house in July has all the hallmarks of an airport thriller. Perhaps not a very good one, because those involved have been caught. In fact, Jonathan Idema, the first member of the group to be identified, has featured in a book before, about the unsuccessful hunt for Osama Bin Laden in 2001. 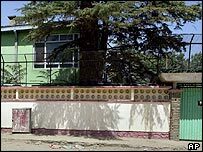 Afghan security agents say they found eight people being illegally detained in a Kabul house by the Americans. The case has also focused attention on the activities of the many ex-military personnel working in Afghanistan now, many on contracts for the US government. As one former soldier engaged in government work admitted to the BBC, it's difficult knowing who's genuinely doing government work and who is not. But US officials here insist this group had no official role. The US military sent out an e-mail to local journalists distancing itself from Idema before it was even known he had been arrested. Security sources told the BBC the US military had been circulating a "wanted" style warning about Idema before that, describing him as armed and dangerous and asking that he be detained by any security forces that came across him. Idema was certainly known to some in the media who covered the overthrow of the Taleban in 2001. He describes himself as a security adviser and features in the best-selling and somewhat gung-ho book Task Force Dagger - the hunt for Osama Bin Laden. He also has a criminal record. The US State Department has identified Brent Bennett as another member of the group and also insisted the US government "does not employ or sponsor these men". However, it is still not clear exactly what they were up to. 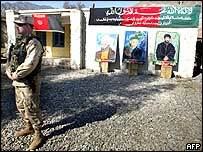 Afghan officials initially said the Americans were on their own private mission to hunt members of al-Qaeda and the Taleban, outside either US or Afghan government control. But all kinds of rumours began circulating Kabul. There was speculation they were after al-Qaeda leader Osama Bin Laden and the $25m reward the US government is offering for his capture. Thousands of former military personnel are making a living in Afghanistan, most working on large security contracts. With security a major problem across the country for the United Nations, aid agencies and other organisations, there is no shortage of work. A British-based private security company is helping the UN with its efforts to organise Afghanistan's planned elections. But privately, some security workers admit the prospect of multi-million-dollar rewards may have lured other former soldiers to engage in their own bounty-hunting missions. Not that people doing this tend to reveal themselves. And some in the security community admit to concerns as to how this incident could affect them. One admits "it can be very difficult to tell who is official and who is not". Afghan security agents who carried out the raid said all three Americans were dressed in typical US Special Forces garb and had US weapons. But around Kabul you often see armed Western security personnel in the same kind of "uniform" - dark sunglasses, desert scarves and boots, carrying pistols in leg-holsters. Often they are private contractors. Phil Halton of Anso, an organisation that provides security advice to aid agencies, admits there may be a "perception" problem now. He points out that it is well known that the US government uses many private contractors. 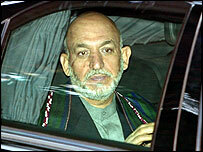 For instance, a private US security firm is guarding President Hamid Karzai. Contractors have also been used by the CIA to interrogate detainees in Afghanistan. That makes it harder for the US authorities to convince people that they are not involved with people like Jonathan Idema.